The Space Needle, that famous flying saucer on a stick, is Seattle’s Eiffel Tower—it looks like the future as imagined by a bygone age, yet somehow remains the city’s most enduring icon. But truth be told, the Jetsons-esque structure has failed to retain the popularity of its Parisian counterpart. Newer attractions like the nine-acre Olympic Sculpture Park, dotted with large-scale beauties by the likes of Alexander Calder and Richard Serra, have lured sightseers away from the 56-year-old tower. And in an age of food-savvy travelers, its campy revolving restaurant can’t compete with James Beard–approved eateries in nearby neighborhoods Belltown and Queen Anne. But starting this week, visitors can see the $100 million renovation designed to reignite enthusiasm around the 605-foot landmark, which drew two million–plus visitors to its UFO-shaped “top house” when it debuted as the centerpiece of the 1962 World’s Fair. Once wrapped in a metal and concrete cage, the top house’s re-imagined Observation Deck now offers visitors not just the thrill of vertigo-inducing heights, but unobstructed views of the city made possible by 48 one-ton glass panels installed with the aid of attached drones. One level below, the restaurant’s rotating floor has been updated with a glass one—the first of its kind, according to project architect Alan Maskin—through which visitors can spy its 12-motor turntable at work, plus a bird’s eye look at the busy Seattle Center campus 500 feet below. Inward-facing glass benches on the Observation Deck serve as serious selfie bait, creating the illusion that the photographer is dangling impossibly in the sky. Thanks to a grand new circular staircase, visitors can travel directly from the deck to the dining level below. The eatery, currently shuttered, will re-emerge with a 1960s-inspired interior from Per Se designer Adam Tihany and a yet-to-be-determined concept. Details will emerge this fall, says Space Needle spokesperson Karen Olson, whose lofty plans include “reinventing dining.” After all, says Olson, “we’re the Space Needle. Why should we compete with anyone?” Tickets: $14–$29; kids under five are free. With the new glass-on-glass remodel, it's official: No experience in town can compete with the Space Needle for overall exhilaration and unobstructed views. But if you’re looking for further opportunities to get high (insert legalized marijuana joke here), head to one of these destinations, all easily accessible from downtown. At more than 900 feet, this glass-lined chamber on the 73rd floor of Seattle’s tallest building is a great way to get a broad view of the city, plus nearby Bainbridge Island. Tickets: $14–$22; kids under four are free. On a clear day, climb about halfway up super-steep Queen Anne hill—or, you know, hop a bus—to experience the best outdoor vantage point in Seattle. A local favorite for sunsets on summer evenings, it’s also a top spot to catch a glimpse of Mount Rainier. Free. 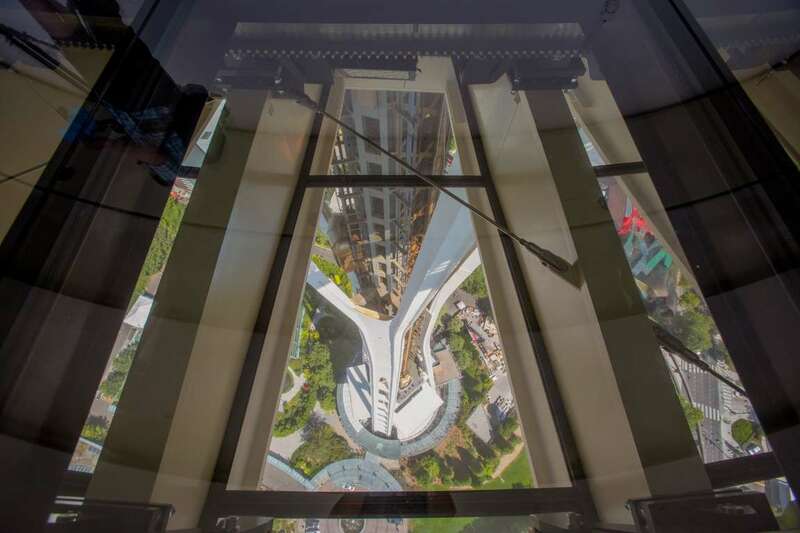 For watery downtown panoramics, nothing beats dangling in a glass-lined gondola 175 feet in the air. Grab a drink from the bar at the base—served in plastic sippy cups for safety—then prepare for a dizzying experience aboard this sky-skimming Ferris wheel. Tickets $9–$50 (VIP); kids under three are free. If 360-degree views from an outdoor observation patio aren’t attractive enough, the well-wrought cocktails at the top of Seattle’s first skyscraper should seal the deal. Completed in 1914, the building’s easy to pick out thanks to its pencil-esque pointy top. Tickets: $14.25–$18; kids under five are free. Care for some cardio with your view? Brave the 100-plus stairs up this brick-walled silo in the Capitol Hill neighborhood, and you’re rewarded with charming views framed by storybook domed windows. Better still, it’s inside one of Seattle’s comeliest green spaces, also home to an exquisite plant observatory and the Seattle Asian Arts Museum. Free.